“HOW DO WE USE OUR NATURAL RESOURCES SUSTAINABLY? “SUSTAINABILITY EXISTS IN THE MIND, BODY AND SPIRIT. ALIGN THEM AND TAKING ACTION FOR DOING GOOD BECOMES SECOND NATURE. “WHAT ELSE CAN YOU SAY ABOUT UN'S 17 SDG? IT'S SYNERGY AT ITS BEST. IT'S NOT JUST BUSINESS, IT'S PERSONAL. Aichmi Group is a Malaysian company with an international team of collaborators. We create awareness to lead transitions from conventional extractive model to circular regenerative and restorative industry system. The seventeen Sustainable Development Goals are our shared vision of humanity and a social contract between the world’s leaders and the people. 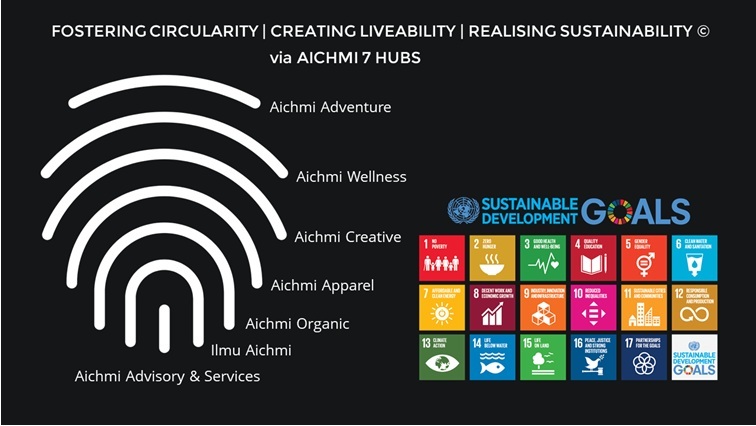 Aichmi Group subscribes to the United Nations Sustainable Development Goals, which was launched in 2016. It paves the way for bold and transformative actions that transcends nations and industries to achieve a way of life that preserves the planet. We answer that call to action by fostering circularity, creating liveability and realising sustainability. To get full benefit of our website, please utilise Desktop view. Alternatively, view on your mobile/tablet in landscape mode and get a glimpse of our pro bono talk slideshow at the top of the page.